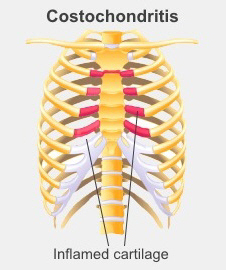 Costochondritis (cos-toe-kon-dry-tis) is an inflammation of the front part of your rib cage. This is the part that connects your ribs to your breastbone (sternum), and it's called the costal cartilage. It is a common cause of chest pain. Although costochondritis is not harmful, it can be worrying, as the pain can be severe and can feel like the signs of a heart attack or other heart and lung conditions. If you have chest pain it is essential you see a doctor even if you think you have costochondritis, as chest pain is often a sign of something more serious. If you are worried you may be having a heart attack you should call 111 immediately and ask for an ambulance. The symptoms of costochondritis include pain around your breastbone, pain that gets worse when you take a deep breath or cough, and tenderness in your ribs and chest muscles. There is no clear cause for costochondritis, but it can happen after an injury, heavy lifting, severe coughing (such as when you have a chest infection), or with arthritis. Usually if your doctor thinks you have costochondritis you won't need any tests. However, they may ask you to have a heart tracing (ECG), chest X-ray, or blood tests to rule out other things that may be causing your chest pain. Costochondritis usually goes away on its own after about four to six weeks, and seldom comes back. If the pain is very severe or lasts a long time your doctor may give you an anti-inflammatory medication such as ibuprofen, or paracetamol. Occasionally a person with costochondritis may need stronger pain relief, such as codeine. Physiotherapy may also help. This video shows a stretch for your pectoral (chest) muscles that can help costochondritis. You can do it in a doorway, as the video shows, or against a wall. Stand with your arm bent at the elbow, and your forearm against the wall or door frame. Your elbow should be at least as high as your shoulder. Put the foot that is on the same side in front. Turn your body slowly away from your arm, until you feel a stretch. Adjust the height of your elbow and arm if it is very painful. Hold the stretch for 30 seconds, and do it three times on each side. Repeat this 20 times a day (meaning you do 60 stretches on either side every day).